South African Emergency Personnel's Union was established in 2006 at Jane Furse village, Makhuduthamaga municipality which is situated in Sekhukhune district [Limpopo Province] by Mr. Mpho Mpogeng. Its co – founders are Mr. M M Disegoane, Mr. F K Maila and the Late Mr. ST Sithole. We were legally registered with the Department of Labour on 19 February 2008 and our national office is based at New Hospital Road back opposite Vulamehlo Security. This trade union was established after realising that all EMS personnel’s in the country are affiliated to unions which do not understand the EMS sector. That is the reason it is designed to deal specifically with the challenges facing the EMS sector personnel’s [e.g. Paramedics, Fire Fighters, Emergency Care Practitioners/Personnel’s]. As the union we are intending on unifying the emergency services in the South Africa and do away with the provincial administration as it varies from province to province. 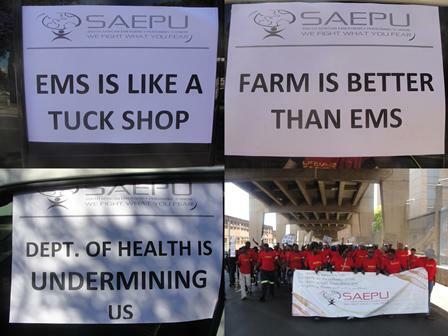 SAEPU welcomes any personnel in the EMS sector to join, irrespective of whether they belong to private or public sector. We posses an understanding when it comes to issues relating to EMS sector, we do not generalize, we are the specialists in this field. It is time for your voices to be heard. SAEPU is here to listen, represent and provide what you need. So join us in making the difference and shaping EMS Sector for the next generation and generations to come. To Develop strategies and programs in partnership with public, private sector and civic society. Working together with all relavant stakeholders and sphere of publuic in a good spirit wich will contribute to the better working environment and quaily of life. Harnersing the skill, experience and knowledge of workers. Promoting Sustainable development. Empowering the workers through participation, health, education, capacity building and information services.